WatchGuard® Technologies, a leader in integrated security platforms, today announced that its Unified Threat Management (UTM) and Next-Generation Firewall (NGFW) appliances are the first to allow users to deploy, configure and manage both wired and wireless network security through a single appliance in a “single pane of glass” view. 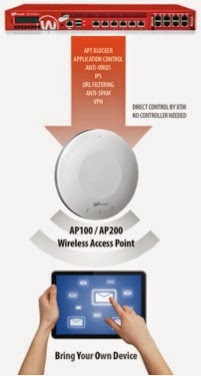 This enhanced wireless functionality – made possible by the release of WatchGuard’s Fireware® 11.9 operating system – eliminates the need for additional wireless network management solutions, and gives IT professionals a unified Web interface for managing and monitoring their entire network in real time. The enhanced functionality of 11.9 gives IT professionals the ability to quickly map wireless Access Points (APs) and coverage, change both wired and wireless security policies simultaneously, and to enforce traffic, coverage and security standards across the entire network infrastructure. The organization can also evaluate traffic and channel conflicts, identify vulnerabilities, manage bandwidth prioritization and even map all wireless activity on neighboring networks sharing the same frequency. This insures that all traffic and security issues are apparent and can be addressed in real time, including rogue APs that may mimic others on the network. Version 11.9 of WatchGuard’s Fireware operating system includes other Best-of-Breed services such as: AntiVirus, AntiSpam, Application Control, Advanced Threat Protection (ATP) and Data Loss Prevention (DLP). Fireware also integrates WatchGuard Dimension™, the company’s award-winning big data visibility tool, through any WatchGuard threat management appliance. *Disclosure: An important note, we are just sharing this information to the public, provided by our source. WatchGuard Technologies - Info / Logos / Photos / Images have respective copyrights.